Windy with rain showers. High 53F. Winds SSE at 20 to 30 mph. Chance of rain 40%. Higher wind gusts possible.. Rain showers this evening with overcast skies overnight. Low 46F. Winds S at 10 to 20 mph. Chance of rain 60%. Local riders Ella Skalwold and Alex McAndrew ride fat bikes on the Kingdom Trails network on Darling Hill in East Burke. 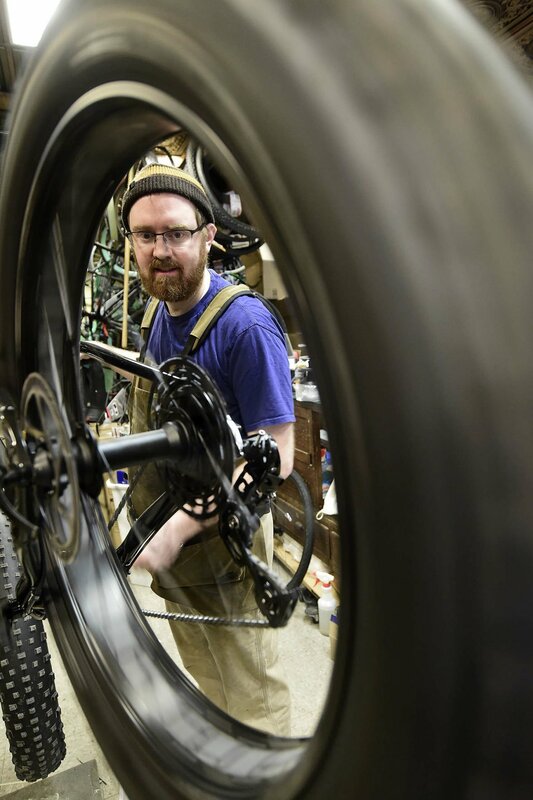 Darren Ohl, owner of the Vermont Bicycle Shop, in Barre, works on a Norco Bigfoot fat bike at his store last week. It’s lunchtime on a regular Tuesday at Vermont Bicycle Shop on Main Street in Barre, and owner Darren Ohl is tending to two fat bikers. It’s not a comment on the body size of either of the riders. Rather, their winter mountain bikes are equipped with 5-inch-wide wheels, about twice the thickness of a regular mountain bike wheel. Their fat bikes are specially designed for riding on snow. As one of the customers settles up after having some work done to his bike, he tells us that he’s off to ride the trails at Millstone Hill. Everyone agrees conditions are great for riding right now, and the trails are well-groomed. Millstone Trails Association uses a snowmobile with a grooming attachment to put its mountain bike network into shape for winter riding. Fat bikes ride well on the soft snow, but need some compaction under the tires for good traction. Another customer, Dave Kelly, of Plainfield, tells about his recent trip to Kingdom Trails, where their trail network is also groomed for fat biking in the winter. “It was fun, it was mountain biking in the winter,” said Kelly. “We didn’t have mountain biking in the winter 15 years ago,” before fat bikes came onto the market, he added. As is the case for most fat bikers, Kelly likes that fat biking complements skiing. “On days that skiing’s bad, the fat biking’s good,” he explained. Fluffy powder snow calls for skis, but when the snow on the mountain or trails has settled and packed down, or when the snow is crusty, firm, or icy, conditions call for fat biking. It’s just another way to get outside and have some fun in the winter. Ohl says the $1,500 Norco Big Foot is a great entry model, especially for someone who will ride just a few times a month. But, for a rider who is planning to put in a lot of time on their bike, Ohl says a higher-end model, like a $3,000 carbon fat bike, could be a better choice. It offers a lighter and smoother ride than the lower-cost aluminum model, and it comes with better components, like shifters and brakes. “I try to understand where a customer currently rides or what they want to do with the fat bike,” says Ohl, and then he caters his recommendations from there. At Onion River Outdoors in Montpelier, Asa Skinder, a sales associate, says customers can get onto a fat bike for $1,000 to $1,500, with models like the Rocky Mountain Blizzard 10 or Specialized Fat Boy SE. “These options are a pretty good, somewhat affordable way to get into the sport,” says Skinder. On the higher end of the price spectrum is a Rocky Mountain Blizzard 30, at $2,400, or the Salsa Bucksaw, which his team just finished selling to a local Montpelier rider. These bikes offer suspension forks to absorb the bumps on the trail, plus higher-end components. In addition to the bikes themselves, fat bikers should think about their gear, like footwear and gloves. “The extremities are especially important with fat biking,” says Matt Mendrala, a bicycle mechanic at Village Sport Shop in East Burke. Patience is another consideration: Conditions can be variable, and riders should monitor the weather or call ahead to trail centers to find out how the trails are riding. Studded tires are a must, he adds, since icy conditions are frequent in Vermont. Pricing for fat bikes is roughly the same at Village Sport Shop, and again at Green Mountain Bikes in Rochester, where owner Doon Hinderyckx says he steers customers to certain models based on what they want to spend. He does offer a “super budget” model for $750 that “works fine, but is not as good quality.” He sells his rental bikes at the end of the season, though, which can be the best way to get into an affordable fat bike. Hinderyckx had just returned from riding his fat bike at Rikert Nordic Center in Ripton, where he houses a fleet of rental bikes to ride on the groomed trail network. He’s especially having fun on an electric-assisted fat bike that he sells for $4,200, which will be reduced to $3,500 at the end of the season. To join in the fun, see the list below of bike shops offering sales and rentals, along with nearby trail networks. Vermont Bicycle Shop (www.vermontbicycleshop.com) in Barre offers 24-hour rentals for $40. The rental fee will be applied to the purchase of a new bike, if the customer decides to buy. Shop owner Darren Ohl recommends Millstone Trails Association, with a groomed network in the Barre Town Forest. Riders must buy a $10 day pass or be members; annual memberships can be purchased through Vermont Mountain Bike Association. See the MTA website for maps, parking, and more information, at www.millstonetrails.org. Onion River Outdoors (www.onionriver.com) in Montpelier offers fat bike rentals for $30 for 1 to 4 hours, $50 for 4 to 24 hours, or $95 for two days. Riders can take their rental bike to the newly approved groomed trail network in North Branch Park, within city limits. Find maps and details on the Montpelier Area Mountain Bike Association website, at www.bikemamba.org. Green Mountain Bikes (www.greenmountainbikes.com) in Rochester offers fat bike rentals for $50 per day out of the shop. The shop also houses a fleet of rental bikes at nearby Rikert Nordic Center in Ripton, where bikes can be rented for $15 per hour. Rikert also allows riders to bring their own bikes, as long as the tires are 3.5 inches wide or fatter. Either way, riders will have to buy a trail pass for $25 for adults; discounts and season passes are also available. Find more information at www.rikertnordic.com. Village Sport Shop Trailside (www.villagesportshop.com/about-us/darling-hill) in East Burke offers rentals for $55 for aluminum bike models and $70-85 per day for carbon models. The rental runs from 9 a.m. to 5 p.m., and half-day rates are available for $15 less. Riders can leave right from the shop and enter the Kingdom Trails groomed trail network with the purchase of a trail pass for $15 or season pass for $75. Get trail details, maps, and sign a waiver ahead of time at www.kingdomtrails.org. The Jay Cloud Cyclery (www.thejaycloud.com), a bike shop located in Montgomery Center, houses rental fat bikes at the base of Jay Peak Resort, where fat bikers can enjoy the 25-kilometer Nordic trail network. Rentals are available for $20 for one hour, $30 for two hours, $40 for a half-day, or $60 for a full day. Rental rates include a trail pass. Riders can bring their own bikes and purchase a trail pass for $15 per day or $100 per season. Find more information about the Nordic center at https://jaypeakresort.com/skiing-riding/nordic-center.